To analyze the results of LASIK retreatment performed by relifting the original femtosecond laser–created flap. A retrospective analysis was performed on 1298 eyes from 688 patients treated with LASIK using the femtosecond laser to identify 88 consecutive eyes of 71 patients that underwent attempted flap lift to treat residual refractive error. The eyes were separated in groups in which the flap lift was possible or flap lift was not possible to investigate factors that could make flap lifting more difficult. The main factors evaluated were bed and side-cut energy and time between original surgery and retreatment. In addition, all retreated eyes were studied as a group to evaluate the refractive outcomes of flap lift retreatment. In 10 (11.3%) retreated eyes, flap lift was not possible without risk of flap injury due to strong healing of the original femtosecond laser interface. 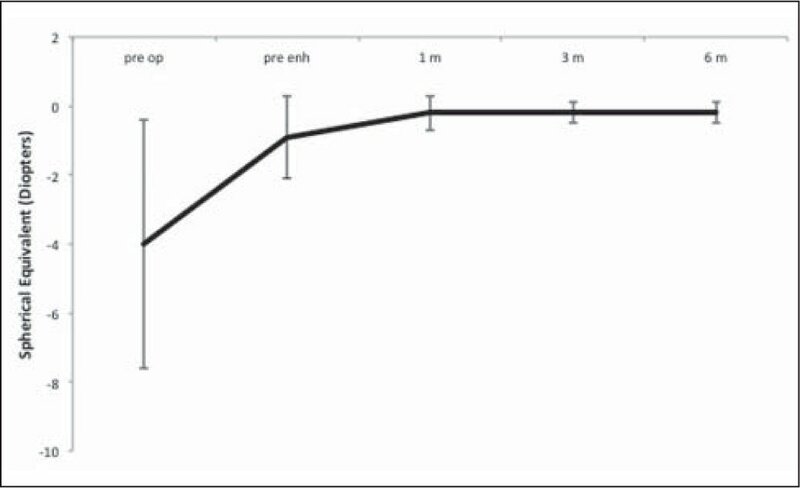 The group of eyes in which the flap could not be relifted had the attempted retreatment performed a longer time period after original LASIK (10.3±3.3 months) compared to the group in which the flap could be re-lifted (5.24±3.14 months) (P<.001). No significant differences were found between groups in any other parameters, including bed and side-cut energies. After retreatment, 82% of eyes achieved 20/20 or better uncorrected visual acuity. This study provides clinical evidence that flap lift retreatment after femtosecond laser–assisted LASIK achieves excellent clinical results and is significantly easier to perform in the first 6 to 8 months after primary LASIK. From The Cole Eye Institute, The Cleveland Clinic, Cleveland, Ohio. Supported in part by Research to Prevent Blindness, New York, New York. The authors have no commercial or proprietary interest in the materials presented herein. Although it is often possible to safely relift a microkeratome flap ⩾10 years after the original LASIK surgery, it may be, at least in some eyes, more difficult to relift flaps ⩾1 year after LASIK performed with a femtosecond laser.6 This healing difference compared to the microkeratome is less pronounced with some femtosecond lasers, such as the 30- and 60-kHz IntraLase (Abbott Medical Optics, Santa Ana, California) lasers,7,8 but remains a problem in some eyes treated with these lasers, making it necessary to enhance the original LASIK procedure using another method, including photorefractive keratectomy (PRK) with mitomycin C (MMC).9 The purpose of this study was to investigate the difficulties encountered and the results achieved during LASIK retreatment in eyes that originally had femtosecond laser flaps. A retrospective analysis was performed on 1298 eyes from 688 consecutive patients initially treated with femtosecond laser–assisted LASIK for myopia at Cole Eye Institute, Cleveland, Ohio, and 88 eyes from 71 patients from that group that underwent retreatment to improve vision. The institutional review board at the Cleveland Clinic approved this study. The criterion for LASIK retreatment was patient dissatisfaction with uncorrected visual acuity in the eye caused by residual refractive error with a stable refraction at least 3 months after the procedure. All patients who had retreatment were included, even patients who had PRK retreatment because the flap could not be lifted. Eyes that were intentionally undercorrected to provide monovision but eventually enhanced to achieve full correction were also included. Eyes in which flaps were lifted for epithelial ingrowth (none), flap striae (six), or diffuse lamellar keratitis (none) after the original surgery were excluded from this study, according to the original study design. A single surgeon (S.E.W.) performed the flap lift in all cases. Relifting the LASIK flap was attempted in all retreated eyes, but was abandoned in cases where the surgeon deemed there was risk the flap could be torn or otherwise damaged due to the strength of healing at the flap margin or in the interface. Strong resistance to lifting with the forceps and iris spatula to the point of possible flap damage led the surgeon to abandon the flap lift approach. The eyes were separated into two groups: one group in which the flap lift for LASIK retreatment was completed; and one group in which flap lift for LASIK retreatment was attempted but could not be completed. Factors that might contribute to difficulty in lifting the flaps were analyzed and included femtosecond laser bed energy, side-cut energy, and the time between the original surgery and retreatment. In addition, all eyes that had retreatment were studied to investigate the results of LASIK retreatment after femtosecond laser–assisted LASIK. Before the primary LASIK procedure or LASIK retreatment, patients had a complete ophthalmic examination that included uncorrected (UDVA) and corrected distance visual acuity (CDVA), manifest and cycloplegic refraction, computerized videokeratography (Humphrey Atlas; Carl Zeiss Meditec, Dublin, California), slit-lamp microscopy, Goldmann applanation tonometry, binocular indirect ophthalmoscopy through dilated pupils, and ultrasonic pachymetry (DGH 5100; DGH Technologies Inc, Exton, Pennsylvania). Postoperative assessments were performed at 1 day, 1 week, and approximately 1, 3, 6, 9, and 12 months after surgery. Postoperative treatment in LASIK or LASIK retreatment included topical antibiotics and prednisolone acetate 1% (Alcon Laboratories Inc, Ft Worth, Texas) eye drops four times a day for 1 week. In addition, non-preserved artificial tears were used four to eight times a day for 1 month. A standard primary LASIK technique was used in all cases. Two drops of proparacaine HCl 0.5% (Allergan, Irvine, California), spaced a few seconds apart, were instilled in the operative eye just before treatment. Flaps were created with a 60-kHz IntraLase femtosecond laser. Femtosecond laser flaps were 9.0- to 9.3-mm diameter (the largest within this range possible sparing the limbus) and a standard 55° hinge and 55° side-cut angle. The attempted flap thickness was 100 to 110 μm in all eyes treated with the femtosecond laser. The hinges in all eyes were superior. The patient’s eyelids were disinfected with povidone-iodine and draped in a sterile manner. A flexible aspirating wire lid speculum connected to suction was placed in the eye. Refractive ablation was performed with the VISX S4IR excimer laser (VISX, Santa Clara, California) according to a surgeon-specific nomogram. After laser application, both the flap and stromal bed were irrigated with balanced salt solution, followed by sweeping of the stromal bed with lint-free sponges to remove any debris in the interface or tongues of epithelium at the flap edge. The bed and flap were irrigated again with filtered balanced salt solution and the flap was smoothed into position with an iris spatula. The flap was smoothed with a moistened triangular sponge and the gutter examined for uniformity around the circumference of the flap with a dry triangular sponge. Topical antibiotic and corticosteroid eye drops (prednisolone acetate 1% ophthalmologic suspension USP) were applied to the eye. The flap lift for LASIK retreatment was performed using a previously described technique.10 Briefly, a Sinskey hook was pressed into the epithelium at the limbus approximately opposite the hinge and dragged, with posterior pressure, toward the center of the flap until the instrument tip fell into the potential space at the flap edge. The tip of the Sinskey hook was used to open the flap margin for 1 clock hour at this location. The edge of the flap was grasped gently with a 0.12-mm forceps and retracted back across the superior conjunctiva. The excimer laser ablation was applied, and the remainder of the procedure and postoperative care were identical to primary LASIK, including application of prednisolone acetate 1% and antibiotic topically four times a day for 1 week. Statistical analysis was performed using SPSS for Windows (version 115; SPSS Inc, Chicago, Illinois). For statistical analysis of visual acuity, logMAR values were used. Normality was evaluated using the Kolmogorov-Smirnov test. Data were evaluated with analysis of variance. Categorical variables were compared using the Fisher exact probability test. Differences were considered to be statistically significant when P<.05. Eighty-eight (6.8%) eyes of 1298 consecutive eyes from 688 patients who had femtosecond laser–assisted LASIK underwent retreatment for residual refractive error. All retreatment procedures were performed between 2006 and 2011. Mean age of the retreated patients was 44.2±7.3 years (range: 21 to 65 years). Fiftyfive (63%) eyes were from female patients. Among the eyes that had LASIK retreatment, 85 (96.6%) had only one retreatment procedure, whereas 3 (3.4%) had two retreatment procedures in the same eye. Of the eyes that had a second retreatment after flap lift, the second retreatment was PRK in one eye and flap lift retreatment was repeated in another eye. Photorefractive keratectomy was performed in the first eye due to insufficient residual stromal bed. In the third eye, flap lift was not possible for the first retreatment and the patient had both retreatments performed with PRK. Table 1 provides characteristics of primary LASIK eyes and retreated eyes included in the study obtained from examinations performed before primary LASIK and before LASIK retreatment. Mean time between the primary procedure and retreatment was 7.3±4.5 months (range: 3 to 24 months). Most (90%) retreatments were performed within the first 12 months after the initial procedure, and 50% took place between 3 and 6 months after the primary surgery. In 10 (11.3%) eyes, the flap could not be safely lifted for retreatment due to strong healing of the flap margin and interface. All of these eyes were retreated using PRK with 0.02% MMC applied for 30 seconds. Table 2 shows the pre- and intraoperative characteristics of the eyes that underwent attempted flap lift to treat residual refractive error. Statistical analyses revealed a significantly longer period of time between the original surgery and retreatment in the group of eyes in which the flap could not be lifted compared to the group of eyes in which flap lift was completed (P<.001). No significant differences were found in average bed energy (P=.90) or side-cut energy (P=1.00) between the group in which flaps were lifted and the group in which flaps could not be lifted. The rate of unsuccessful attempted flap lift increased with time after the original procedure. After primary LASIK, 100% of flaps could be lifted at approximately 3 months after surgery, 99% could be lifted at approximately 6 months after surgery, 94% of flaps could be lifted approximately 9 months after surgery, and 91% could be lifted at approximately 12 months after surgery (Fig 1). Figure 1. Rates of successful LASIK flap relift after primary LASIK with a femtosecond laser. At approximately 3 months after LASIK, 100% of flaps were relifted; at approximately 6 months, 99% of flaps were relifted; at approximately 9 months, 94% of flaps were relifted; and at approximately 12 months, 91% of flaps were relifted. Uncorrected distance visual acuity improved significantly after flap lift and LASIK retreatment. Before retreatment, 55% of eyes had UDVA of 20/40 or better and 33% had UDVA 20/30 or better. After retreatment, 95% of eyes achieved UDVA 20/40 or better, 90% had UDVA 20/30 or better, and 82% had UDVA 20/20 or better. After retreatment, 2 (2.2%) eyes lost 1 line of CDVA, and 1 (1.1%) eye lost 2 lines of CDVA. No eyes lost more than 2 lines of CDVA. Conversely, 10 (11.3%) eyes gained 1 line of CDVA, and 4 (4.5%) eyes gained 2 lines of CDVA. Figure 2 demonstrates that on average eyes that had retreatment showed stability in spherical equivalent refraction between 1- and 6-month follow-up after retreatment. Figure 2. Mean spherical equivalent refraction of eyes retreated with flap relift after femtosecond laser–assisted LASIK. Preop is before primary LASIK and pre-enh is just prior to retreatment. Error bars represent ±1 standard deviation. No serious complications were attributable to flap lift in eyes that had LASIK retreatment following primary femtosecond laser–assisted LASIK. No cases of torn flaps, sterile or infectious keratitis, flap displacement, or visually significant flap striae occurred after retreatment. 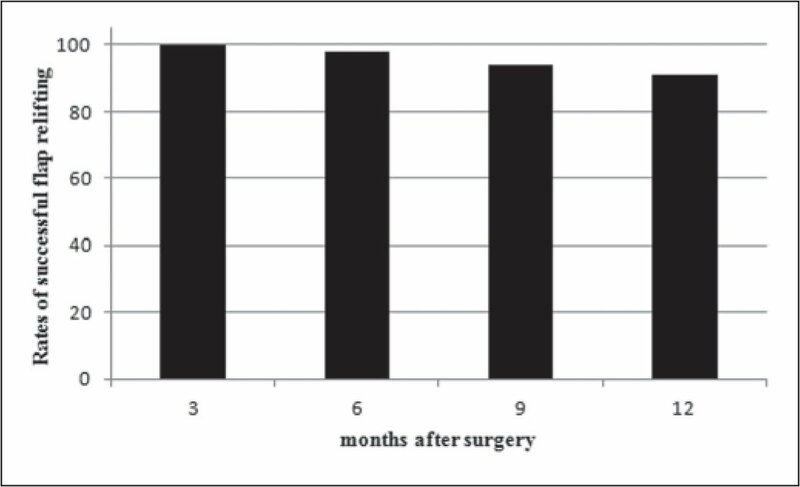 Overall retreatment rate in this series was 6.8%, which is comparable to recent reports for microkeratome LASIK and PRK.11 Laser in situ keratomileusis retreatment can be performed by relifting the original flap, recutting a new flap, or surface ablation on the flap.11 Relifting the flap is the most common retreatment procedure, and studies have suggested that re-lifting the flap has advantages over recutting the flap–lamellar interface for LASIK retreatment, including increased safety.6,12,13 In this study, the results of flap relift for retreatment were analyzed and factors identified that may affect the relifting of LASIK flaps made with femtosecond lasers. 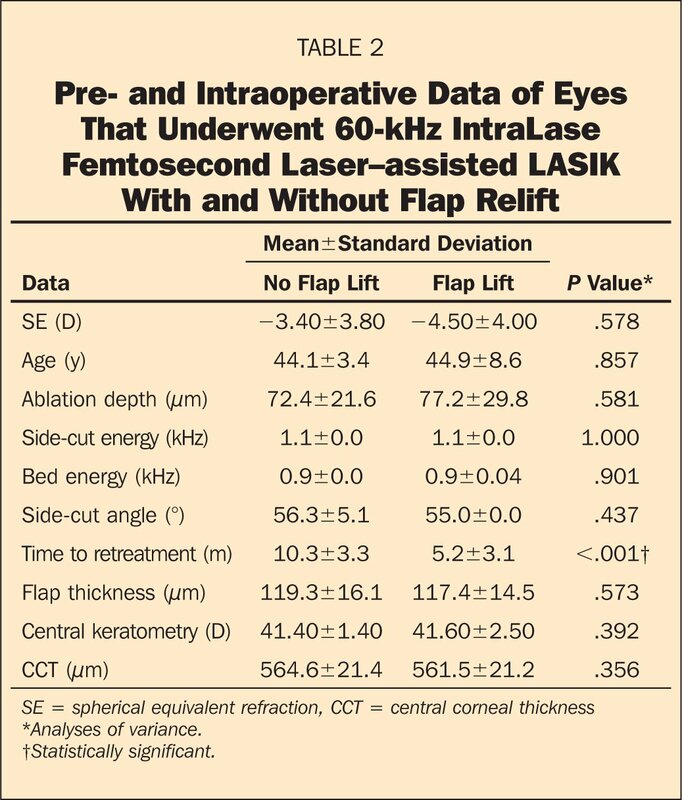 When utilizing a later model femtosecond laser to create a LASIK flap (60-kHz IntraLase laser in the present study), surgeons can perform flap relift for retreatment in the majority of cases performed within 1 year after the primary LASIK procedure using a recently published technique.10 The results of this study show that flap relift is a safe and effective technique to treat residual refractive errors after femtosecond laser–assisted LASIK. The main factor identified that influences whether a femtosecond laser flap can be re-lifted is the time between the original LASIK surgery and retreatment procedure. Thus, if the retreatment is attempted ⩽6 months after the original LASIK procedure, virtually 100% of flaps can be relifted. However, when the procedure is attempted approximately 1 year after surgery, there will likely be some eyes in which flap relift is difficult due to strong healing. In these cases, another technique, such as surface ablation, should be considered. Netto et al7 have shown that the 60-kHz IntraLase femtosecond laser, which uses low energies from 0.8 to 1.2 μJ, produces levels of interface inflammation and stromal cell proliferation at the flap margin that are not significantly different from the microkeratome after LASIK surgery. With the earlier femtosecond laser models, such as the 15-kHz, the wound healing response is greater7 and flap relift is often more difficult. Kim et al5 showed that flap adhesion strength of LASIK flaps made with a femtosecond laser tended on average to be higher than LASIK flaps made with a microkeratome. Factors other than energy delivery may also be important for some femtosecond laser models. For example, with the 15-kHz and early 30-kHz IntraLase models, the side-cut ablation created a furrow at the flap edge that was obvious to the surgeon at the operating microscope.7 This furrow made it easier for the surgeon to identify the flap edge during the primary LASIK procedure. However, this furrow also triggered greater epithelial and stromal damage that led to a greater stromal healing response, including greater myofibroblast generation that produced greater haze at the flap margin, which was visible at the slit lamp by 1 month after surgery.14,15 This increased healing at the flap margin correlated with increased difficulty in relifting the flap for retreatment when LASIK was performed with the earlier IntraLase femtosecond laser models.7 With the later 30-kHz IntraLase laser (model II), 60-kHz IntraLase laser models (models I and II), and the 150-kHz IntraLase laser, the width of the side-cut is markedly reduced7 and the flap margin healing response is decreased. Thus, with later femtosecond laser models, relifting the flap for retreatment tends to be similar to relifting of flaps produced with a microkeratome, at least in the first 3 to 6 months after the LASIK procedure. In the cases where flap relift was accomplished, the results show that flap relift is an effective and safe method for correcting residual refractive errors after primary femtosecond laser–assisted LASIK. Thus, retreatment by relifting improved UDVA with excellent safety measured by minimal loss of CDVA and few other complications. Some authors have reported increased complications such as epithelial ingrowth or generation of striae after LASIK flap relift,18 but that has not been our experience with the method we routinely use.10 Recutting of the flap bed across the visual axis for retreatment is more likely to lead to serious complications such as producing an unattached sliver of stromal tissue that results in irregular astigmatism.11 Coskunseven et al25 recently reported good results with LASIK retreatment using a femtosecond laser to repeat only the side-cut, but only a small number of eyes were included in the study. When femtosecond flap relift is difficult and the surgeon decides not to proceed because of concern the flap will be damaged, our preference is to use PRK with MMC for retreatment. Prior studies have demonstrated the efficacy and safety of this approach, despite increased patient discomfort and longer visual recovery.26,27 Haze has been reported after PRK with MMC to retreat an eye that had primary LASIK,28 but we did not note this complication in the PRK retreatments in the present study. This study provides clinical evidence that flap lifting after femtosecond laser–assisted LASIK is no more difficult to perform than after microkeratome LASIK and is an effective technique for correcting residual refractive errors. The main factor influencing ease of flap lift and rate of conversion to surface ablation is time between the original surgery and LASIK retreatment. Netto MV, Mohan RR, Medeiros FW, et al. Femtosecond laser and microkeratome corneal flaps: comparison of stromal wound healing and inflammation. J Refract Surg. 2007;23(7):667–676. Randleman JB, White AJ, Hu MH, Stulting RD. Incidence, outcomes, and risk factors for enhancement after wavefront-optimized advanced surface ablation and laser in situ keratomileusis. J Refract Surg. 2009;25(3):273–276. Domniz Y, Comaish IF, Lawless MA, Rogers CM, Sutton GL. Recutting the cornea versus lifting the flap: comparison of two enhancement techniques following laser in situ keratomileusis. J Refract Surg. 2001;17(5):505–510. Talamo JH, Meltzer J, Gardner J. Reproducibility of flap thickness with IntraLase FS and Moria LSK-1 and M2 microkeratomes. J Refract Surg. 2006;22(6):556–561. Alió JL, Piñero DP. Very high-frequency digital ultrasound measurement of the LASIK flap thickness profile using the IntraLase femtosecond laser and M2 and Carriazo-Pendular microkeratomes. J Refract Surg. 2008;24(1):12–23. Kymionis GD, Portaliou DM, Tsiklis NS, Panagopoulou SI, Pallikaris IG. Thin LASIK flap creation using the SCHWIND Carriazo-Pendular microkeratome. J Refract Surg. 2009;25(1):33–36. Neira-Zalentein W, Moilanen JA, Tuisku IS, Holopainen JM, Tervo TM. Photorefractive keratectomy retreatment after LASIK. J Refract Surg. 2008;24(7):710–712. Srinivasan S, Drake A, Herzig S. Photorefractive keratectomy with 0.02% mitomycin C for treatment of residual refractive errors after LASIK. J Refract Surg. 2008;24(1):S64–S67.